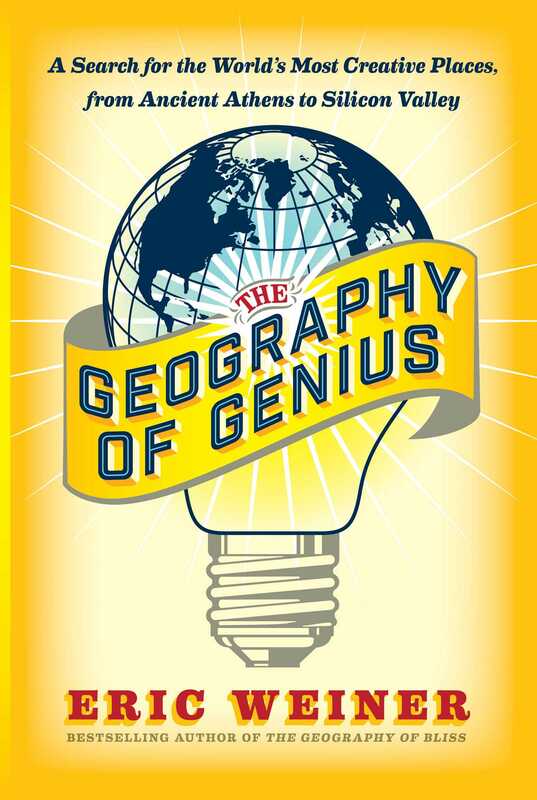 Travel writer Eric Weiner on his book, "Geography of Genius"
Travel writer Eric Weiner argues that creative genius can sometimes be closely tied to place. In his new book, Geography of Genius: A Search for the World’s Most Creative Places, from Ancient Athens to Silicon Valley, he takes readers on a journey to explore the times and places that have had “genius clusters.” Knowledge@Wharton recently spoke with Weiner about his book on the Knowledge@Wharton show on Wharton Business Radio on SiriusXM channel 111. Knowledge@Wharton: Geography and travel are certainly loves in your life, but how did the tie-in with genius come about? Eric Weiner: I want to state right up from that I’m not a genius. I’m interested in genius the way, say, a hungry person is interested in a Philadelphia cheesesteak…. I’m motivated, like everyone, to be a bit more creative, maybe not to achieve genius. As you alluded to, I’m a travel writer, and I see the world through the prism of place. I really do believe that place matters a lot more than we think it does, that where we are affects who we are. That applies to happiness, to spirituality and to creative genius. If you look around the world historically, where did geniuses pop up? It wasn’t randomly — one in Philadelphia, one in Siberia, one in Bolivia. They have appeared in groupings, or what I call “genius clusters,” at specific times and places. I really don’t think that’s a coincidence. The question I set out to answer in this book is, what was in the water back then and can we bottle it? What lessons can we learn from these places? Knowledge@Wharton: This is a historical look at this topic and you go way back on this. Weiner: Genius is nothing new. We may have turned it into a bit of, frankly, an industry in this country — the creativity industry — but people have been creative for a lot longer than the word “creativity” has existed, which, by the way, has only been in widespread use since the 1950s. Back then, in the time of Athens or China in the 13th century, they didn’t even think of it as being, “Oh, we’re being creative,” they were just doing their thing. Look at Athens as an example in 450 BC. You had Socrates. You had Sophocles. You later had Plato and Aristotle. All in the same city at roughly the same period of time. Not a coincidence — and not just a Western phenomena. I made a point in this book in trying to expand our concept of genius beyond the Western one, so I went to China. I went to Calcutta, India, admittedly not a city that most of us associate with genius, but for a while, it certainly was. Knowledge@Wharton: There obviously was something about Athens itself that allowed that to really develop. Weiner: Absolutely. I start off by saying that if you were to time travel back to, say, just before that time period, roughly 500 BC, and you were surveying the land, which was a bunch of Greek city-states, hundreds of them, really, of which Athens was only one, you would not have placed your money on Athens necessarily because there were other city-states that were bigger, wealthier, stronger militarily like Sparta, but they didn’t shine the way Athens did. The question is, “Why?” It wasn’t that Athens was blessed with great, say, land. The land was arid and barren and hardly produced any food. They had lots of sunshine, but so did other places in Greece, so it wasn’t the weather. It was an attitude, and it always is an attitude. It’s a culture. In the case of Athens, it was an outward-facing orientation. By that, I mean they were great sailors. They were great moochers, to be honest. This is one thing that surprised me. The Greeks didn’t invent as much as we think they did. Plato famously said, “What the Greeks borrow from foreigners, they perfect.” Well, “borrow” is a generous phrase. They stole, but they then did perfect. That’s always the case. It’s the case in Silicon Valley today. Very little invented there. A lot is perfected there. Knowledge@Wharton: Looking at the various places you bring up in this book, were there any similarities between them? Weiner: There is a set group of ingredients, if you will, that I found in all these places. Maybe they appear in different proportions, in different places. But as I said, first of all, there’s always an openness. So psychologists investigating creativity have identified on a personal level this one trait: openness to experience. It’s the single most important trait in creative people. It turns out that’s true for places, as well. You don’t see a lot of geniuses coming out of North Korea now…. It’s not an open society. It’s not that the North Koreans are genetically inferior or they are not hard workers…. It’s not a place where ideas are coming in or getting out, and in all the genius clusters I visited, they were particularly porous that way. One aspect of that is immigration. Whatever you think of the current immigration debate, it’s simply a fact that places that produce geniuses tend to have more open policies toward immigrants. It was true in Ancient Athens; it’s true in Silicon Valley today…. [Next,] a degree of wealth. These were not dirt-poor places. Florence and the Renaissance is a good example. They became very successful financially through the cloth trade and through banking. The Medici, the patrons of that day, leveraged it and invested it in the arts. They backed artists like Michelangelo and Leonardo and many, many others. Were it not for their patronage, we probably wouldn’t have all that great art that we admire today. [Finally,] a degree of competition. I would add, also, a constructive, healthy kind that spurs people onto greatness and doesn’t just become this toxic force that eats people up…. Knowledge@Wharton: Edinburgh makes the list. Explain the history. Weiner: The city of Edinburgh in the 18th century was, believe it or not, the place to be — which was extremely unlikely. Small even by the standards of the day — 45,000 people, maybe 50,000 — pretty far north, far away from everything else. But you had an amazing amount of genius going on at that time. You had David Hume, the philosopher; Adam Smith, essentially the founder of modern economics; James Watts, down the road in Glasgow with his steam engine; James Hutton, the founder of modern geology; Adam Fergusson, the founder of sociology; the list goes on and on. It was a very convivial place. It’s called “The Scottish Enlightenment,” some people joke it should be called “The Scotch Enlightenment” because they drank Scotch. They actually drank a lot of red wine back then, even more than Scotch. It was a classic case of one genius playing off of another. They would get together in these clubs. One famous one was called the Oyster Club, where the likes of Adam Smith and David Hume would get together every Friday at 2:00 PM and drink wed wine and eat oysters, which was peasant food back then, and discuss. You know, conversability, as David Hume put it, was a big deal back then and it was interdisciplinary. You had people from different walks of life, different social strata getting together…. Knowledge@Wharton: You also talk about Calcutta, as you mentioned, which is interesting because of the transformative change. Weiner: Quite frankly, it’s not a city that we associate with genius today. We associate it with poverty, despair, Mother Teresa. Those are the images that come to mind. But in the late 19th and early 20th century, it was definitely a place of genius, and produced a Nobel Prize Winner … and published more books than any city in the world except for London. But as you said, it declined. That is something about all these genius clusters: they don’t last very long…. Maybe a couple generations, maybe a century, if they’re lucky. With a few exceptions, it tends to be a one-way street. Once you go down, you tend to keep going down. Vienna was an exception. It had a double dipper of genius: first, a musical genius — say, 1780, 1790 – then, 100 years later, Sigmund Freud’s Vienna blossomed. But that’s unusual. Look at Detroit today, having a hard time coming back…. Knowledge@Wharton: Eric, you talk about some of the characteristics of geniuses out there. One of the interesting things that you bring up is the level of education. Higher education may not always correlate to being a genius. Weiner: Exactly. This might be discouraging to anyone who’s on the PhD track, but typically, if you have a PhD, you’re less likely to be a genius, to achieve that status than someone without it…. Steve Jobs didn’t finish college. The same was true of Bill Gates and Woody Allen. Going back historically to Leonardo da Vinci, it was a different university system then, but he was not a particularly good student. He didn’t speak Latin very well, which was the lingua franca at the time. This is really not that surprising because geniuses are shaking up the status quo. A university — even a good university — is part of that status quo and will only tolerate so much dissent. We have to jettison this notion that a genius is just a smart person that gets really good grades in school or has a high IQ. I’m talking about a creative genius, someone that creates something that lasts through the ages…. Knowledge@Wharton: You also mentioned that there are several cases of people that you qualify as geniuses who also had a big life event happen to them early on, like the death of a parent…. Weiner: Typically, the death of a parent. Looking back historically, a disproportionate number of geniuses lost a parent at a young age. Others suffered illnesses in their lives. Most famously, Beethoven’s deafness. Aldous Huxley was technically blind. Michelangelo had health problems. John Adams said that “genius is sorrow’s child.” I don’t know if I’d go that far, but clearly, having some bad stuff happen to you at a young age in some people — and that’s the key caveat — tends to produce a mother load of creative genius. In other people, unfortunately, it breeds despair and delinquency. Why the difference in one person to another? That’s a great mystery. I don’t think anyone has the answer to that. Someone called into the show claiming that Steve Jobs was obviously a genius. I would argue that he was not a genius because he was not solely responsible for any of Apples products. While their products have had a major influence on society, they were the result of many people and many of the ideas originated at other companies. Having met both Steve Jobs and Bill Gates, I would say neither of them fit the genius profile. Both have simply took ideas and products generated elsewhere (SPARC/Lisa, Nokia, Sony; SCP-Seattle Computer Products), and cleverly marketed them. Like parasites thriving in the business of ripoff an exclusive marketing arrangement deals.